Made these for Super Bowl party and they were a hit. I used different cookies in the recipe. (Didn't know there were so many varieties). 1. Used Golden Oreos with Biscoff spread. 2. Used Triple Decker Oreos with Biscoff spread. (favorite at party) 3. 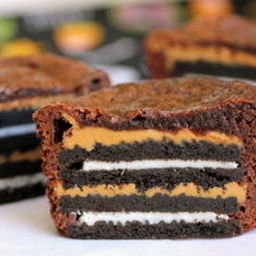 Used Peanut Butter Oreos with brownie in between cookies Looking forward to my next batch. So delicious, especially when you frost them with chocolate icing. They seem tasty, but I learned the hard way that the paper liners are essential. Sprayed muffin tin with Pam instead, and the bottom Oreo was glued like cement to the tin. Had to destroy the cupcakes to get them out. My family and friends thought they were great. I used a 13x9 pan and also crunchy peanut butter. Still turned out great. "The most delicious thing that I have ever put in my mouth" - Kourtney. These things vanished within minutes after the word got out what was in them. We did not have any leftovers when we made them for our weekly Wednesday Night Dinner, and we made 24 cupcakes out of the recipe that was listed. We just used 48 OREO cookies and a 13x9 brownie batter mix.